Bad news for the techies! Microsoft has officially announced that the free OneDrive storage has decreased from 15GB to 5GB and the unlimited storage of Microsoft Office 365 has returned to 1TB. It has been only a year since Microsoft announced Unlimited Storage for the Microsoft 365 customers. But, now Microsoft says that 1TB of data is enough for regular customers who want to store their photos, videos and relevant data. The main reason for taking this action is that Microsoft found many of their customers are misusing the unlimited storage feature of Office 365. Some customers were having more than 75TB of file storage on a single Microsoft account. What will happen if you have more than 1TB of data? Don’t panic! If your account has more than 1TB of data storage, then Microsoft has given you a whole one year to move your extra storage data to others services. I think one year is enough to move or backup your data! Microsoft Office 365 users are now limited to 1TB of data. 100 GB and 200 GB paid subscriptions are removing as an option for new users and the plans will be replaced with a 50 GB plan for $1.99 per month in early 2016. 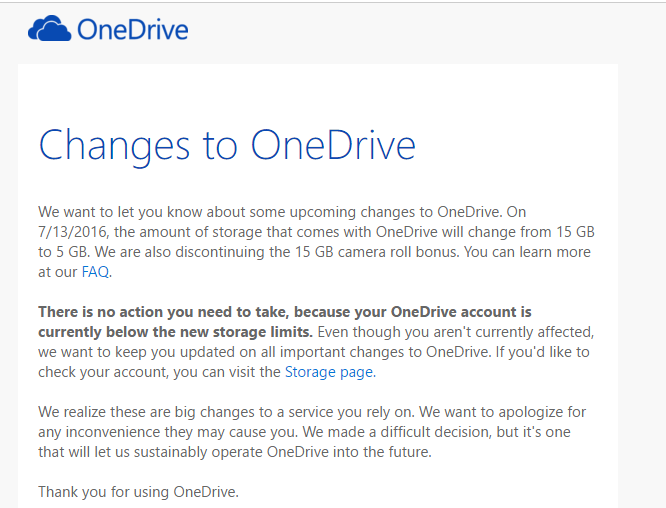 Free OneDrive storage downgraded from 15GB to 5GB for the existing and new users. 15GB camera roll storage will also be reduced. The changes will be affected from early 2016. If you are an existing Office 365 customer and you found that the service doesn’t meet your needs, then you will be eligible for a pro-rated refund. If you are using more than 5 GB of free storage, you will continue to have access to all files for at least 12 months after these changes go into effect in early 2016. Besides, you can redeem a free one-year Office 365 – Personal subscription (credit card required), which includes 1 TB of OneDrive storage. Existing users of standalone OneDrive storage plans (100GB or 200 GB plans) are not affected by these changes. You can read Microsoft’s updated FAQ on their official blog. What do you think about this decision? Do you have more than 1TB of data? Let us know you valuable comments!